A thirty-nine-year-old office worker, always very reserved and withdrawn, who lived apart from her schizoid, infantile husband, met only with aggressiveness the attempts of her fellow patients to draw her into group discussion. She remarked, for example, that she did not want to talk about banalities like the others and that she had no intention of saying anything about her problems, although the others were obviously longing for her to do so. She began to knit ostentatiously, with the obvious intention of irritating the other members of the group. This aggressive attitude towards her fellow group members expressed all her mistrust of people in general, which was perhaps at the root of her addiction, and which became more and more marked in the course of time. When at the next meeting the group members tried again to reach her, she suddenly became more approachable; and when a fellow patient said she wanted to roast a goose for Christmas, she asked her, half ironically, but half-seriously too, if she would invite her. Obviously drug addicts, as Fort (1955) has shown, need their aggressions, even in the narrow circle of the therapeutic group, in order to reach the other members or be reached by them. If the others remain friendly towards them and let them use them as a target, they take this as proof that they really belong. The group becomes for them a place in which they feel more or less comfortable and can talk about their cares and worries, perhaps for the first time. Whereas in the beginning they can enter into an emotional or intellectual relationship only with the therapist, later the whole group and its individual members become their partners with whom they can converse and seek a solution to their problems, some of which are common to all. However, with these patients there is a risk that in group discussions they may avoid tackling their difficulties and try to talk on either banal or highly intellectual themes. The therapist must recognize the underlying emotional problems and bring them into the discussion. We have already mentioned that drug addicts are usually completely isolated from their environment. This is shown by the fact that all members of the drug addicts’ group complain at least occasionally of the lack of understanding shown by their spouses, parents, or children. The social isolation, which had earlier led them to take refuge in drugs, now becomes the motive for the formation of a group, as it stimulates identification between the participants. The therapeutic group becomes the place where patients who were formerly thrown back upon themselves can make contact with similarly lonely people; the sense of community this brings will make it easier for them in the future to renounce the pleasure and self-forgetfulness offered by drugs. The therapeutic group, by gathering drug addicts together and introducing them to each other, performs the essential service of smoothing their path back into society. Through the contributions of the other participants, group therapy helps the drug addict to achieve a more rapid and comprehensive insight into the conditions and causes of the addiction. It often takes many lapses to convince a patient of the necessity to keep off drugs; but we find that with the help of a group he is much quicker to realize that he really must give them up. Patients who before joining a group could not keep free from drugs find it much easier to avoid lapses afterwards. A woman born in 1908, of athleto-pyknic type, most of whose childhood had been spent with foster parents who gave her no warmth or loving care, married, in 1944, a man three years younger than herself whose first marriage had ended in divorce. At first the marriage was happy. In 1960 he made the acquaintance of a much younger woman, and the patient found this out in April 1961. In September 1961 the couple was legally separated. After the patient had been deserted by her husband she felt isolated and lonely; since 1940 she had been increasingly hard of hearing and suffered from paroxysmal fits of giddiness with occasional loss of consciousness (according to an electroencephalogram, temporal lobe epilepsy). After the legal separation she had increasing recourse to the hypnotic Noludar (methyprylone), and having been recommended to take a nightcap before going to bed, she also took alcohol in increasing quantities. Finally, on October 24, 1962, she attempted suicide with sleeping pills. Withdrawal treatment in our hospital from October 24 to November 21, 1961, produced no substantial result, and by the end of January 1963 she had begun to take Noludar and alcohol in excess and in ever-increasing quantities. She had therefore to be treated by us for the second time, from September 5 to November 12, 1963. During her second period in hospital we admitted her into the therapeutic group for drug addicts. She developed a tremendous need to express herself, but she was also interested in the other participants’ worries. At first she complained over and over again that she could not forget her husband and so was often depressed, but in the course of a year during which she attended the group regularly, she became noticeably more balanced and confident. She began to take an interest in her surroundings again, bought a television set, took a pride in her appearance, and began to enjoy good food as she had formerly. During this time she also took a part-time job in which she has to work on her own, and she is very highly thought of there. For this woman the group obviously became at least a partial substitute for her lost husband, perhaps also for the other relationships she lacked. She pointed out in many of the sessions how much she looked forward to the group meetings every time and how intimate she felt the atmosphere of the group to be. An essential contributing factor to this affinity to the group was probably the fact that one patient in particular was encouraged by the group discussions to take a lively interest in her outside the group sessions. The patient has now been off drugs for over a year, and thanks to her rediscovered interest in life she is happy. Naturally it is too early to decide finally whether the treatment has been a success. However, we have the impression that group therapy gave the patient a foothold which individual treatment could not give her. The therapeutic group gives drug addicts the chance to discuss new problems as they arise and to gain comfort, support, and advice from the other members. There is less risk that feelings of unhappiness, which were often at the root of the addiction, can reawaken. When emotions arise in the group members because of unfavorable outside influences they can enter into the general conversation and receive an understanding hearing, whereas previously the drug addicts kept everything to themselves and so built up new resentments against an apparently rejecting environment. These patients are often deeply suspicious of those around them, but the group gives them the new experience of seeing the people they meet as human beings. In their eyes, other people did not understand them or were even downright hostile to them; but now, in their fellow group members they are meeting, perhaps for the first time, people who approach them openly and without reserve. Drug addicts who in their childhood received too little affection (Kielholz & Battegay, 1964) or, on the contrary, were over-mothered and spoiled (Schultz, 1953) often receive compensatory treatment from the other members of the group. The other members generally find out very quickly who has suffered frustration and needs emotional support, and who must be made aware, by denial, of how much emotional attention they have a right to expect from their fellow beings. Although the formation of a group is considerably more difficult with drug addicts than with alcoholics because of the addicts’ marked sensitivity and unsociability, we have the impression that therapeutic group work is especially important for them. It not only gives them valuable insight into the nature of their illness; above all it offers them a chance for unprejudiced social contact. We must remember in this connection that it was often this very incapability of adapting themselves to reality which led them to excessive drug taking. For some years hospitals have been admitting increasing numbers of young delinquents and social misfits; this led us to reconsider the treatment of these patients. On the one hand they cannot adapt to society as it is at present, but on the other hand they tend to form gangs; they are asocial in relation to adult society, but there is no reason to suppose that their attitude to social life is always negative. We decided some years ago, therefore, to treat these young people not only individually, but also by group psychotherapy. We now take an average of six to eight of these young people twice a week for one hour. Besides the doctor in charge of the· group, a woman social worker specially appointed for these patients also takes part. At first we had both sexes working together. Later, however, we restricted group therapy to the delinquent girls, who entered our hospital in greater numbers; with these unbridled young people relations between the sexes had developed which were jeopardizing the success of the therapy. We observed that these young people were able to shed their reserve or even antagonism towards the therapist more quickly in a group than in individual psychotherapy. If they see that others in the group are beginning to talk about their thoughts and longings and their earlier adventures, they realize that it will not be taken as a betrayal if they too begin to talk about themselves and their experiences. The fact alone that the doctor and the co-therapist are present throughout the conversation and utter no word of condemnation leads to a therapeutic rapport. If this is followed up, transference phenomena are generally quick to follow. The members of the group, for example, speak of the therapists as “TeenagerMammi” and “Teenager-Pappi,” or a girl declares that she wishes that the social worker leading the group were her mother. The image of a friend can also occasionally be projected onto the therapist. When these transference feelings arise, the therapeutic relationship usually becomes so strong that these girls lose their old suspicion of adults. There is also often a regression to an earlier stage of development. The girls want all the problems confronting them to be solved by the therapist. They crave support and want the doctor and social worker to stay beside them all the time and protect them, if necessary, even against their own parents. On the one hand it is now important to give them sufficient support so that they can feel that the trust they have placed in the two therapists is absolutely justified. On the other hand we must take care at the right time to let them gradually assume a part of the responsibility for themselves. We have found the provision of a day center outside the hospital for these young delinquents and misfits to be of great value, particularly with a view to increasing their independence. When these patients begin to show the transference feelings we have mentioned and the relationship with the therapist appears to be holding together reasonably well, we receive them in this center for three days a week. There they have the chance to keep house themselves under the guidance of two youth social workers, to cook, and to create something of their own in occupational therapy. They have already acquired a “togetherness” and family feeling through group psychotherapy in the hospital; but since we extended the group treatment of these girls to the day center we have been even more successful in keeping them, largely as a result of this feeling of cohesion. Although some have absconded since then, the therapeutic group has had a centripetal influence on these young people which stops them from running away. They can also often accept the rules of the group more easily than those of their own family, so that they no longer have to turn away from social reality, which, according to Meyer (1962), is characteristic of young absconders. They can often accept the reality of the youth group when they reject other social institutions. However, we cannot allow everything, unconditionally, in group sessions with these young delinquents and misfits. We must rather take care, as Friedemann (1957) said was also necessary in group psychotherapy with children, that a sense of social proportion is awakened in these patients. They must learn not to seek the immediate gratification of their own desires but to bow to reality, as typified by the group. If we are to draw a conclusion from the group treatment of these young people, we must say that it allows us to make therapeutic contact with them and lead them back into society better than exclusively individual psychotherapy could. If these girls are put into a therapeutic group it first becomes for them a pattern of society, and their social instincts are awakened; and then they find security by realizing their responsibility to the group for their words and actions. A patient born in 1943 lost her mother in her fourteenth year. Her father spoiled her on the one hand and made too many demands on her on the other, as she was obliged to take her mother’s place in the family. She began to associate increasingly with young hooligans and was obviously becoming delinquent. In July 1962 she was committed to a reformatory, but soon absconded. During her stay in our hospital from July 19, 1962, to August 9, 1963, she not only received individual psychotherapy, but was also included in the group of delinquent girls. Whereas at the beginning she rejected all attempts at therapy and remained defiant, she showed herself in the group to be dependent and in need of support. A secure relationship developed with both the doctor in charge of the group and the social worker. The urge to run away, which the patient had at first and partly put into practice, receded further and further into the background. In contrast to her earlier attitude, she was now ready to begin training (in beauty culture) and did so in the summer of 1963. She has now (February 1965) kept up this improvement for more than a year, still comes every week to the group sessions in our day center, and is on the best of terms with the social workers there. This patient, who after her mother’s death had to take on responsibilities that were obviously too heavy for her, could depend on grown-ups again in the psychotherapeutic group, where she found security and support, and also a mother-substitute in the person of the co-therapist. In the spring of 1964, after having worked analytically for years with groups of doctors (we shall have more to say about this later) we decided to form an analytical group consisting exclusively of neurotics. We were guided in this chiefly by the experiences of Foulkes (1964), Genevard (1961), Grinberg et al. (1960), Kemper (1959), and Wiesenhutter (1961). It is usually not very easy, however, to find patients in a psychiatric hospital who are suitable for inclusion in a group of neurotics. Neurotic patients rarely need hospital treatment, and as a rule they are hospitalized only for a short time, so that we must first find out whether they will be able to continue to take part in group activities after their discharge from hospital. For the reasons mentioned we included only neurotics with the most difficult social backgrounds; these were the only ones who stayed long in a hospital. We also had to take care that no patient in the group received individual psychotherapy from either of the two therapists. 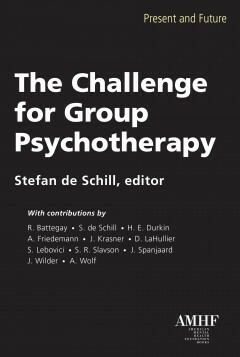 If individual treatment and group therapy were given at the same time by the same therapist, too many varied and complicated transference relationships might arise, which would certainly overtax the patient’s capacity for integration. We felt, however, that group work carried on simultaneously with individual psychotherapy was indicated for these patients, since they had had particular difficulty in fitting into a social environment, which was why their hospitalization had become necessary. Initially our neurotics’ group was made up of four female patients between the ages of twenty and twenty-five; we have just added a fifth. Only female patients were chosen, since attempts to include male patients in the group failed because they could not always promise to continue once they had left hospital. There were other disturbances when one of the patients stayed away from the group for external reasons, and another patient had to be introduced. These patients found it very difficult to form relationships, and at first they spoke only to the group leader and expected the solution of their problems to come from him; but gradually a deeper relationship began to form between the group members themselves. There was always the danger, however, that one of the patients, a twenty-one-year-old neurotic with regressive and demonstratively hysterical tendencies, who had grown up partly amid parental discord and partly in uncongenial children’s homes, would attempt to monopolize the discussion. The other three were at first not in a position to check the tendencies of this patient, so that during this initial phase the doctor in charge of the group had constantly to intervene. Another of the participants, a twenty-four-year-old neurotic depressive, whose sight had remained poor after operations for double congenital cataract and double secondary glaucoma, developed during this time from a completely withdrawn personality to a remarkably open and receptive one. It was obvious that her concern for the patient with infantile hysterical tendencies, whose deep psychological distress showed clearly beneath her exhibitionism, helped substantially to strengthen her badly damaged self-confidence. “I was on a cliff with other girls, and I kept slipping. I was frightened of falling. So I climbed down from the cliff. On the way down I met Dr. B. He pulled me up again. I slipped and fell down again. Dr. B. pulled me up again.” This was repeated several times. Another patient, who previously could not bring herself to accept any individual therapy, a twenty-five-year-old neurotic depressive nurse, was at first constantly pouring forth self-accusations arising from severe guilt feelings. In the course of group psychotherapy she gradually came out of herself and was clearly becoming better adjusted to the group, though she did not yet show such clear transference indications as the patients we have mentioned. She even began to talk about beginning a psychoanalysis. The fourth member, who has been in the group for the shortest time, was a very infantile twenty-year-old who had never been able to hold down a job and had not enough courage to take part spontaneously in group discussion. The intense neurotic disturbance of the others were manifest in the fact that they scarcely noticed this patient’s reserve, and it did not occur to them to draw her into group discussions. It was for the therapists to support this infantile patient, who was quite incapable of holding her own, and to prevent her from being totally ignored. We cannot yet say much about the neurotics’ group, as it has been in action for so short a time. But we have the impression that although three of these patients (and the one who has just joined us) are also receiving individual psychotherapy, and the fourth is soon to begin a psychoanalysis, the group psychotherapy is offering them a social experience they would not have otherwise had. It could not, for instance, have been an accident that the hysterical patient, in the dream we have mentioned, found herself on a cliff with other girls. Her earlier dreams held very little suggestion of community with other people. In this dream we can recognize at least the beginnings of it. Because group psychotherapy provides an experience of reality through the interaction of the group members, it is sometimes possible to dispel neurotic delusions that persist despite their elucidation in individual psychotherapy. The group members, who, as a result of their psychological conflicts, have focused their attention almost exclusively upon themselves, are beginning to take an interest in each other and in the activities of the group. With the help of individual psychotherapy, complemented by work in the social field, an essential contribution is being made to their resocialization. We are also specially helped in the recognition of neurotic symptoms which obtain in the social sphere and of repressed conflicts which have their roots in a collective situation such as the family group in childhood.